Play Samba de Janeiro™ online for free now! 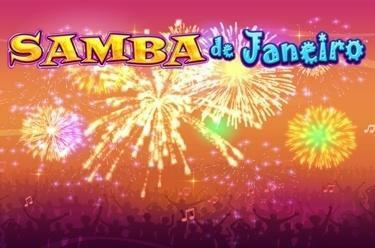 In the slot Samba de Janeiro™ you are cheerfully dancing towards Twists on 5 reels with up to 20 pay lines. The Samba dancer with her swinging hips catches the highest winnings on the reels. The aim in Samba de Janeiro™ is to line up 5 matching winning symbols on one of 20 pay lines that all run from left to right across the reel set. The group of Samba dancers is having a ball on the reels: They act as Wild symbol that substitutes for all symbols in the slot (except for Scatter) and increases your winning chances. The Scatter symbol, the pair of dancers, lights a firework of winnings: it triggers 12 free games if it lands at least 3 times in any reel position. The 12 free games are either triggered by 3 Scatters in any position on the reels or randomly following a spin. At the start of the free games a Wild symbol is placed at random in the top, middle and bottom position of reels 2, 3 or 4. With every spin these Wild symbols are moving down by one position and a new Wild symbol appears in the top reel position on reels 2, 3 or 4. Real summer vibes! Not many slots create that much pizzazz and oomph - and you are cordially invited to join in and dance across the reel set with casually swinging hips alongside the winning symbols. 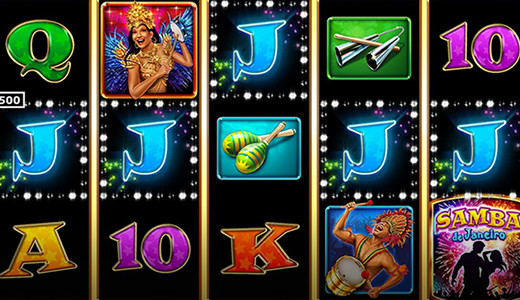 Samba de Janeiro™ offers hot Samba rhythms and even hotter winnings: Once you trigger the free games the wildest Twist dancers are really kicking off!